The desert horned lizard is a common yearlong resident in the Mojave, Sonoran and Colorado deserts (Behler and King 1979) as well as in the northeastern corner of the state. An isolated population exists in San Jacinto River Wash, Riverside Co. (Stebbins 1972). It occurs in all desert shrub types and grass/forb stages of pine-juniper woodlands. 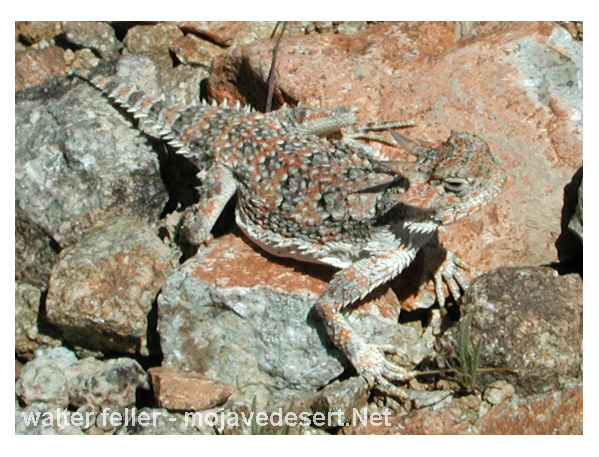 Sparse or open habitats are preferred by the desert horned lizard. Its elevational range extends from below sea level to 2130 m (7000 ft) (Macey and Papenfuss 1991). This species is most active from April to July in lower elevations and from May to September in higher areas. Feeds primarily on ants, also beetles and their larvae, and plant material (Leviton 1972). Forages in rocky and sandy areas (Lawrence and Wilhoft 1958, Shaw 1950), generally sitting and waiting for prey (Pianka and Parker 1975). Sandy soil is preferred for burrowing but also found in sandy-gravelly drainage channels (desert wash) (Stebbins 1954). Eggs are laid in well-drained sandy soil. Found primarily on sandy and gravelly flats, often in areas of wind-blown sand or along washes in arid and semiarid regions (Stebbins 1954). Diurnal (Leviton 1972). Most active April to July at lower elevations, May to September at higher elevations. Hibernates during cool season. 18-22.5 m (59-74 ft) in diameter (Pianka and Parker 1975). Poorly developed (Tanner and Krogh 1973), but this species uses assertive displays (Tollestrup 1981). Breeds May to June. Most eggs are laid in June and early July. Clutch size 7-13 eggs (Taylor 1912). This species overlaps in range with the flat-tailed horned lizard. One record of predation by prairie falcon (Stebbins 1954); probably eaten by roadrunners and hawks. Leopard lizards and snakes may prey on this species, but antipredator displays are often effective (Tollestrup 1981).